For years that I lived in Bentonville and went to the Bentonville Farmers Market, I dreamed of the day I too could have a dog that would come with me faithfully to look at the rows of produce, homemade desserts and jams, and handcrafted household and jewelry items. I finally got my wish! When we purchased our home in Elkins, we knew we would want to get a new dog that spring. As most of you know, we got Flower that March and then Jazzy in June. Flower had health problems the first few months then it just got so dangerously hot that we didn’t do a lot of outside activities with them. We worked on training, but they were not getting socialized for large groups like I had hoped. I kept wanting them to act like perfect angels before we took them to a big public place like a Farmers Market but a group of people convinced me that A) there is no such thing as a perfect angel pet just like kids are never perfect angels, and B) you can’t expect them to behave like well-socialized pets until you, gee…socialize them. So, we’ve been taking them places where people are used to having pets including the pet supply store and the therapy dog group I just joined. Today was the big day, however! 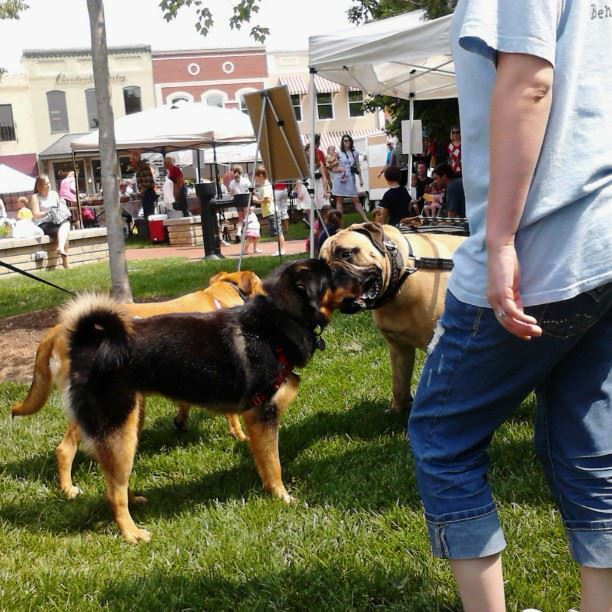 The Bentonville Farmers Market had its spring Dog Days where all the guest vendors were somehow pet related (the market has its outer circle of core vendors each week then there is a theme for the center booths). Despite it being a 50-minute drive for us, John and I headed up to Bentonville with the two woof babies in tow. John said they pulled a little bit and were hard to get to go through the crowds, but there were a ton of new smells and they had never been in that dense of a crowd before. All in all, they did incredibly well for their first time. They didn’t jump up on strangers. They didn’t try to grab food from one of the booths (or a small child). They didn’t get upset by other dogs getting in their face and slobbering. They didn’t try to run to go where they thought they should be at the time. Jazzy and Flower had fun! The proof is in the pictures (forgive the cell phone camera quality!)…. It got pretty humid and after a few rounds around the Square, the girls were tired but happy. 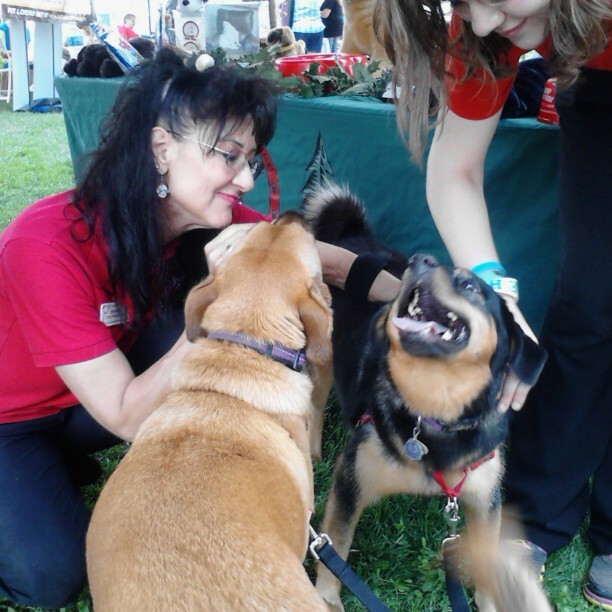 Brenda from Camp Bow Wow is a long-time networking friend of mine and was pleased to say hi to the girls. They loved it (including the treats)! 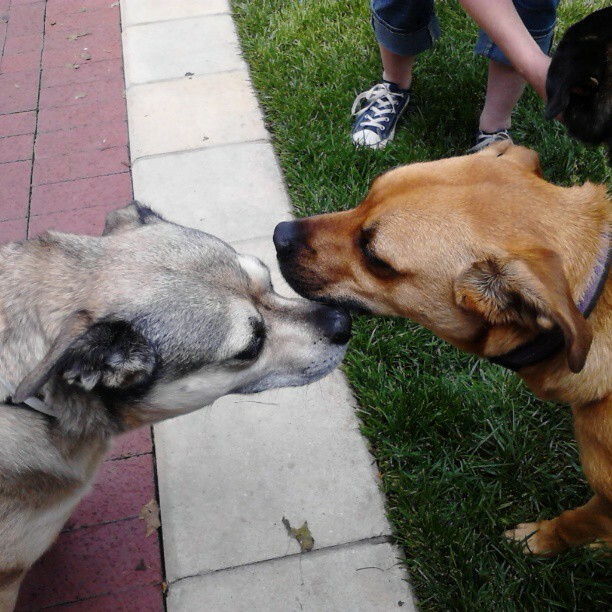 Jazzy carefully greeted an older dog at the Farmers Market. There’s lots of flowers selling right now at the Farmers Market. 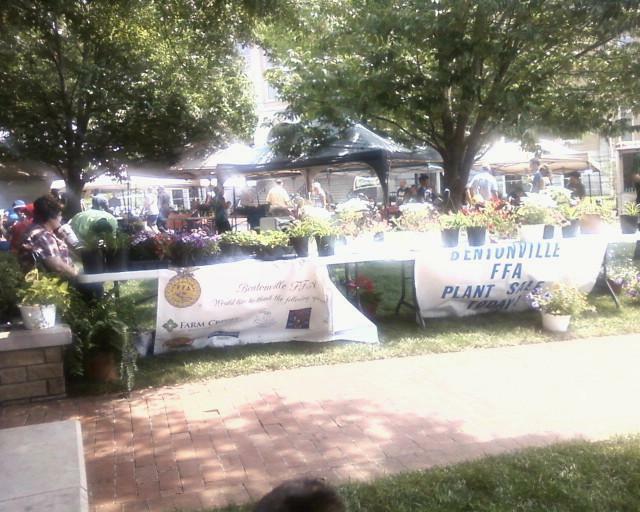 John was thankful that there are tons of great shade trees on the Square. It really was humid. 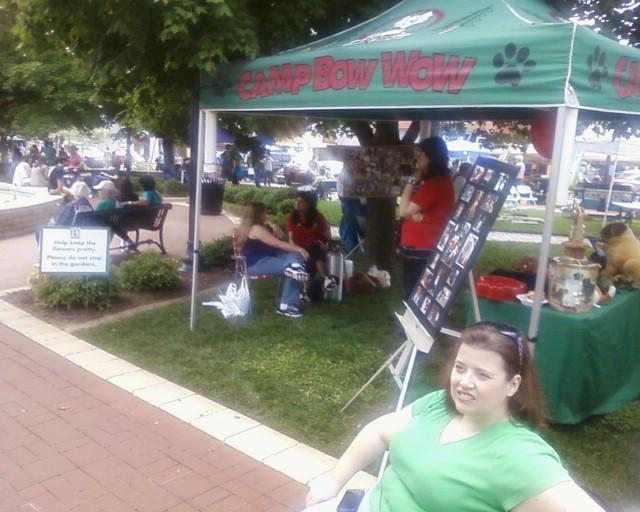 Me at the Camp Bow Wow booth. The sun was in my eyes, hence the weird expression. So cool! 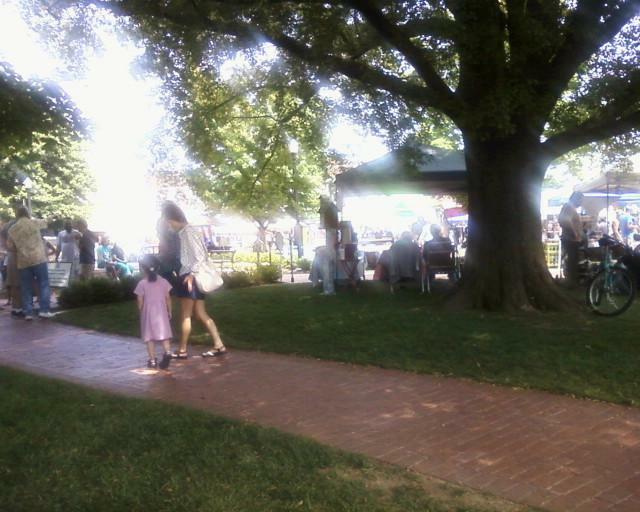 I love to take my Schnauzers to the Fayetteville farmer’s market. They get alot of attention which they love! Oh, somehow I missed that you were local to me! But yes, Fayetteville Farmers Market is next. I’m a little nervous because that is SOOOOO crowded but I’m like you, people are drawn to petting my dogs because they are cute. Fun times for all of you! Yes, thank you! can’t wait to take them again. Good for the kids! They look like a couple of sweeties. Our girls love the Camp Bow Wow folks. They always stay there when we have to board them somewhere. Ours need to socialize more too. They’re both great out and about alone, but together they’re kind of like twins who speak their own language. 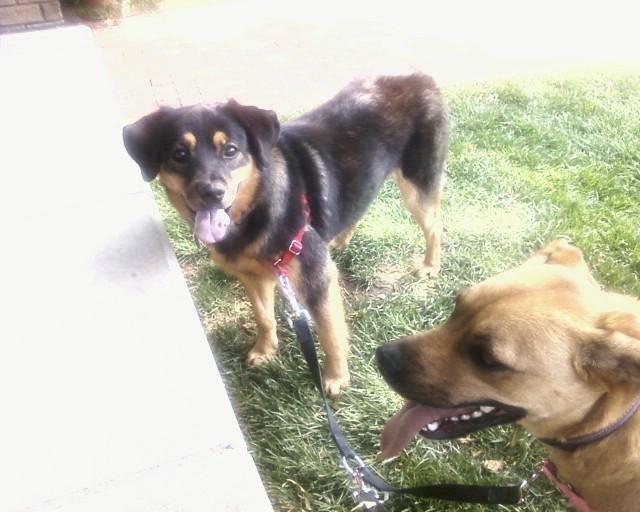 Some Saturday we need to take Lucy or Dory one to the Fayetteville Farmers Market. Until L is bigger, the dogs can’t go unless Bart and I both can go too. Ours work almost eerily like a team. They get weird if we try to walk them separately! Even people at the market commented on it. The pictures say it all – your four-legged children look happy. We are the proud parents to several four-legged children. We love to take them out to walk, we use a stroller for the little ones.